Well, the snow has come and everything has gone back to normal so school is back in session. I have two cards to share with you today. The first is for last Friday's Get Sketchy 24 challenge. I used Taken with Teal, Certainly Celery, Chocolate Chip and Pumpkin Pie for my colors. The flower in the main panel are from SU's Upsy Daisy set and I stamped it in Pumpkin Pie ink on Whisper White card stock. This card is really straightforward, so no need for lots of boring details. The second card I have for you today is for a new challenge (or at least new to me) called Tuesday Morning Sketches. I know, I know....just what I need is anot her challenge. I think I will be alternating this challenge with the MMSC challenges that happen on Tuesdays or I might do both or I might just pick whichever one I like better that week. Who knows, I guess you'll just have to wait and see. I really liked this sketch and was quite pleased with the results. I used Old Olive, Pretty in Pink and Rose Red for the color palette. I used Swiss Dots and Swirls CB folders. The cupcake in the middle is from Inkadinkado "Birthday Cupcake" set. I used some Color Box Chalk Queue inks to stamp it on white card stock. I used blender pens and the same chalk inks to color in the bottom. It's hard to tell in the picture but I did "frost" the cake by combining some clear embossing powder and pink glitter. I put some Tombow Mono liquid adhesive on the top of the cupcake and then poured the powder over it. I heat set it with my heat gun. After it was completely dry I took a Rose Red marker and made the red dots and then actually covered them with some crystal affects. Like I said a bit hard to tell in the picture; but really cool texture IRL. I used Petite Scallop Circle Nestabilities for the Pretty in Pink circle behind the image. 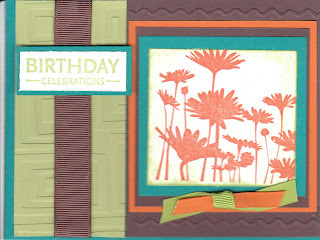 I stamped the sentiment also from the same Inkadinkado set with Olive Pastel Chalk ink. I added the eyelets in the corner to complete the card. Mmmm - yummy! Pretty pink cupcakes will make anyone smile. Great take on the sketch. Thank you for adding Tuesday Morning Sketches to your Tuesday line-up for challenges, I hope you join us often. I am honored to have a real life, published author participating in my challenge. Wow!! Your book sounds really good, I'll have to check it out. I'm an avid reader - I don't watch TV at all, so I'm always on the hunt for a new book. Great take on the TMS sketch! What a fun bday card! Both are very cute, love the cupcake! 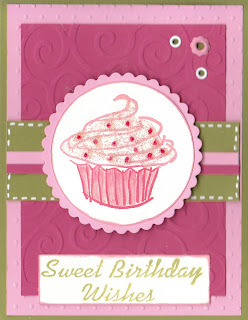 lovin' both of your cards...that cupcake is too sweet and I love your color combo on your Get Sketchy card...thanks for playing! Love the cupcake! Yum, yum!